L'Ecole de Langues offers French Clubs to children from 5 up to 16 years old. Children attending the club are from Barnsley, Wakefield, and Kirklees. The clubs are run by native speakers. We run two clubs on Monday after school from 16.00 until 18.00 in term time only. The first club is for Children between the age of 5 and 10 years old and the second club is for children attending high school and who need further support for their GCSE's. The clubs are run at Cawthorne Primary School, Taylor Hill, Cawthorne, Barnsley, S75 4HB. The sessions for all children last one hour and the fee is £7 per child. 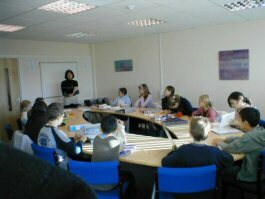 Group 1 from 16.00 until 17.00: This group is aimed at children who are attending Primary School. Group 2 from 17.00 until 18.00: This group is aimed at children who already attend Secondary School.